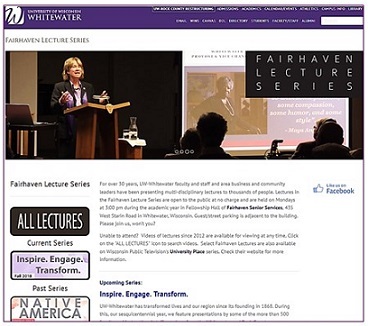 Inspire – Engage – Transform is the theme of the Fall 2018 Fairhaven Lecture Series, offered on Mondays at 3pm in Fellowship Hall (Fairhaven Retirement Community, 435 W Starin Rd, Whitewater). These lectures are free and open to the public! But if you can’t attend in person, videos of lectures since 2012 are posted online. The University of Wisconsin-Whitewater has been affecting the lives and futures of its students for 150 years. The lectures this semester will highlight some of the inspiring ideas campus experts share with their students. Andersen Library can help if you’d like to learn more about lecture topics! For example, for the Oct. 15th topic, search Library databases to find the book Young adult literature: From romance to realism (UWW students and staff may borrow from other UW campus libraries by using the free UW Request service; preview some text via Google Books), and the article “The good, the bad, and the ugly: A qualitative study of how young adult fiction affects identity construction” (Atlantic Journal of Communication, 2015, vol.23:no.3, pp.139–158. https://doi.org/10.1080/15456870.2015.1013104). Please ask a librarian (email, chat, phone 262.472.1032, or visit the Reference Desk) for assistance with finding additional materials. This entry was posted in campus connection and tagged articles, books, education, inspiration, lectures. Bookmark the permalink.